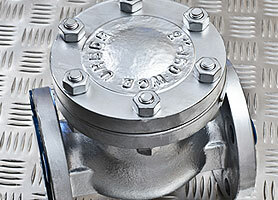 John Bell Pipeline Equipment Co. Ltd stock the complete range of Gate, Globe and Check Valves in Cast and Forged Steel. Flanged ANSI 150 2″- 24″ and Forged Steel 1/2″-2″. Body materials A216 WCB/A105N respectively with Trim Number 8. All items are available from our Aberdeen stocking facility but we can supply any class or material type on a short lead-time.